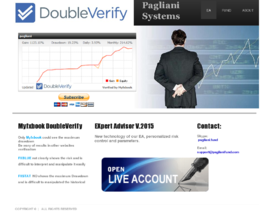 The PaglianiFund MT4 EA is a forex expert advisor. The Pagliani Fund automated forex trading software for the MetaTrader platform has been forward tested on a live account by Forex Peace Army. The PaglianiFund.com forex robot places trades for you. I could not find it. Can you tell me what it cost to buy the ea? I am shopping for a quality ea and I came across your product on FPA. What is the cost of your ea? How do you achieve such high results? If I understand it correctly, they want $299 a month for their signal. There is no demo period offered. In my experience, people who are offering something of quality will let you try before you buy. This does not mean they are a scam, I'd just say buyer beware. This account was traded at leverage of 1:1000 for the first trades and then switched to almost no leverage afterwards...what does it tell you? They were just fake boosting the stats and hoping for the best to rank high on FPA, their stats afterwards show no real skill whatsoever. I wonder how many accounts they blew within 30 minutes before they got one to submit here.